You never know who you’re going to run into when you’re out doing some agriblogging. 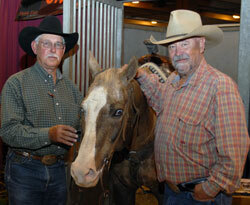 For example, I got to sit down with actor Barry Corbin yesterday at the World Championship Appaloosa Show. He recently completed an award winning short film titled, “Trail End.” The movie stars a great Appaloosa horse. On the left is Tony Nix, owner of the horse in the middle, Chippen Gold (“Chip”). On the right is Barry Corbin. Barry’s starred or guest-starred in too many movies and tv series to list. When I spoke to Tony he says that he got involved after someone at the ApHC made a connection to him when the movie company called seeking a horse in Kansas. He says that Chip was great and showed that an Appaloosa (even an 18 yr. old one) can star in a movie. He also thinks it might be pretty cool if someone would need him to star in a movie too.